Since it had been nearly two weeks since my last visit, I decided to take a quick trip to the wetlands after work today to see how the Great Blue Heron kiddos were doing. All six Great Blue Heron chicks are doing well! There is even one new chick in a nest close by. The Mama, or possibly Daddy, of one of the nests arrived shortly after I got there and was greeted by two hungry, hostile juveniles. 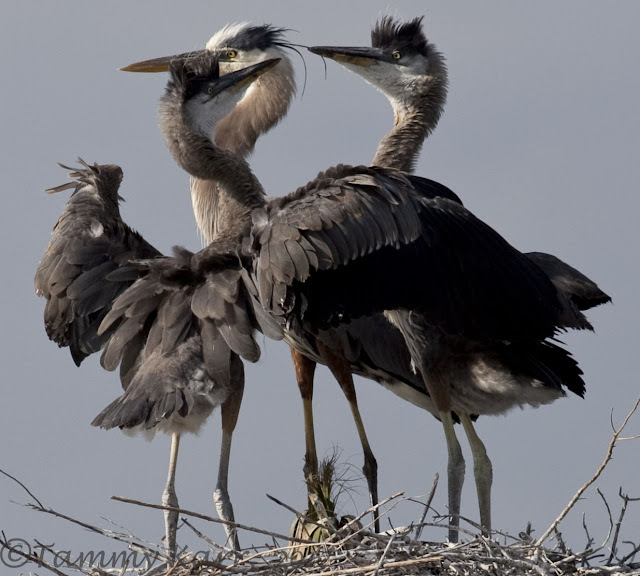 Great Blue Heron parents continue to feed their young for 60 days at which point the chicks are fully grown and able to fledge from the nest. The chicks were more than ready for their meal and quickly got into position to receive their regurgitated dinner. The large chicks made it clear they were very hungry! Feeding these two looked like a dangerous job! 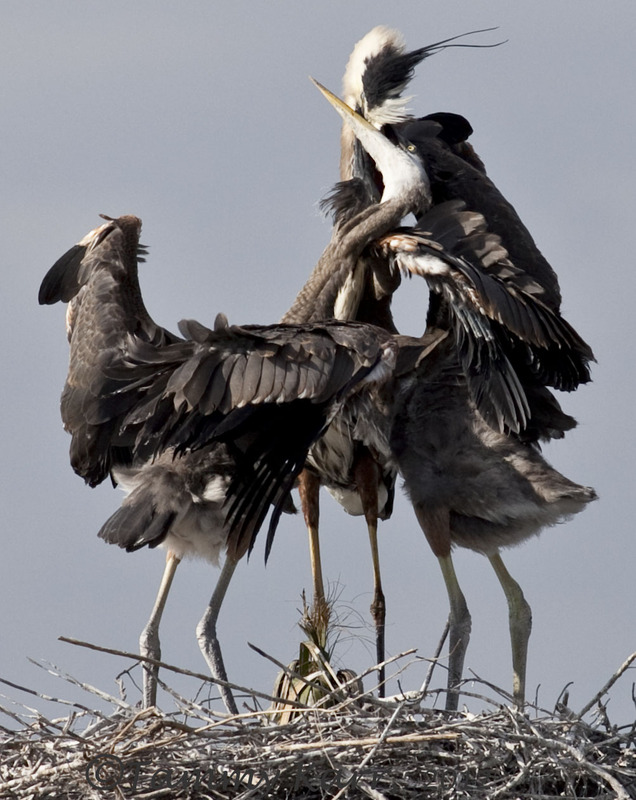 Chicks can become aggressive to one another at feeding time. Luckily it didn't take the parent very long to cough up some dinner. The parent quickly left the chicks to consume their dinner. This chick resides in the neighboring nest. The chicks are all around 50 days old so it won't be much longer until they are on their own! they really are amazing looking 'kids'. yikes! i'd hate to have those beaks coming at me! Epic shots, as always...glad you have the opportunity to watch them grow up. Thanks Steve! They were pretty ruthless to their poor mom, its no wonder she took off so quickly! Great shots Tammy! Someone could lose an eye in that feeding frenzy. Your second photo there should be a statue. I did notice the mom had her eyes shut in several photos, probably did fear for her eyes! ¡Gracias! Cada vez que visito yo sé que puede haber desaparecido. I tlike them all, my compliments. Thank you Joop! I hope you have a Happy Easter also! Have a nice day in Florida ! That's really beautiful, feeding the chicks must be heaven, lol. Superb photography. Wow, they've gotten big! They look much more like mom and dad now. Love these photos, Tammy! Thanks Brian! They do look almost full grown!! I love the seria birds..That's awesome Tammy..
Great action shots Tammy, I can't believe you can leave work and be in the wetlands so easily. 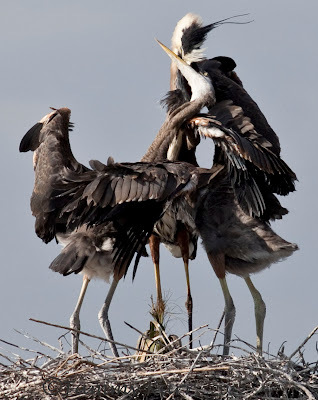 I love that line "see how the Great Blue Heron Kiddos are getting on, fantastic. Lovely photography and interesting subjects! 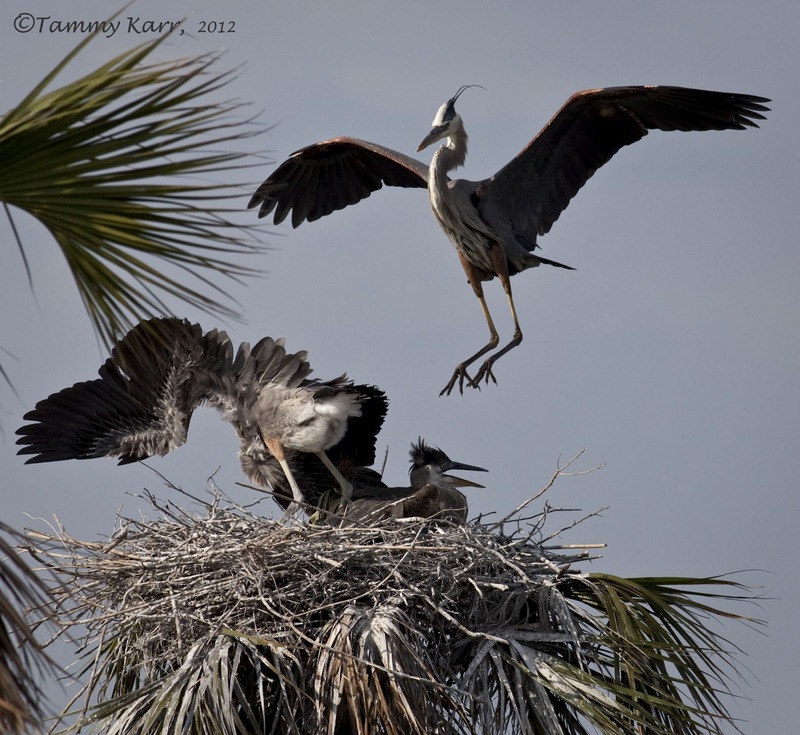 I am amazed that the herons have chicks! Here in the south of France, it is still nesting time! I don't expect to see chicks before another 3 weeks! Thank you for you comments and for visiting my blog:) Nesting here usually starts the end of December/beginning of Jan.
Love the photos and the continuing story of these herons Tammy! Interessante und sehr schöne Bilder. 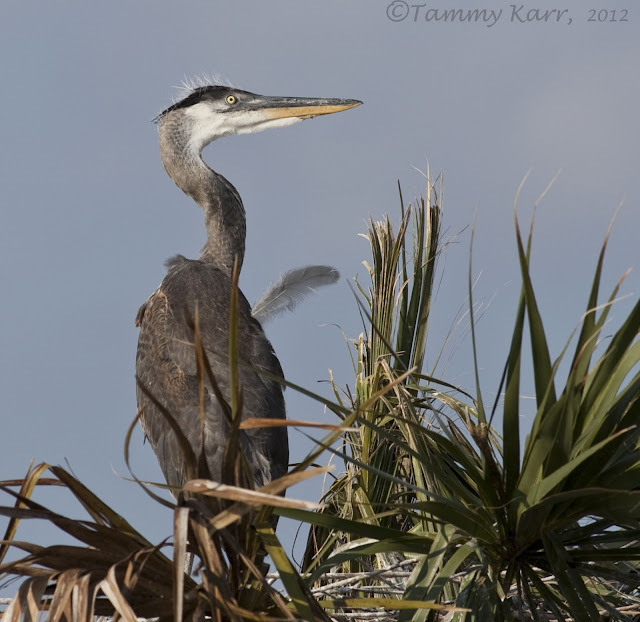 Wonderful to see Tammy... lovely birds and your images are fantastic to see.. 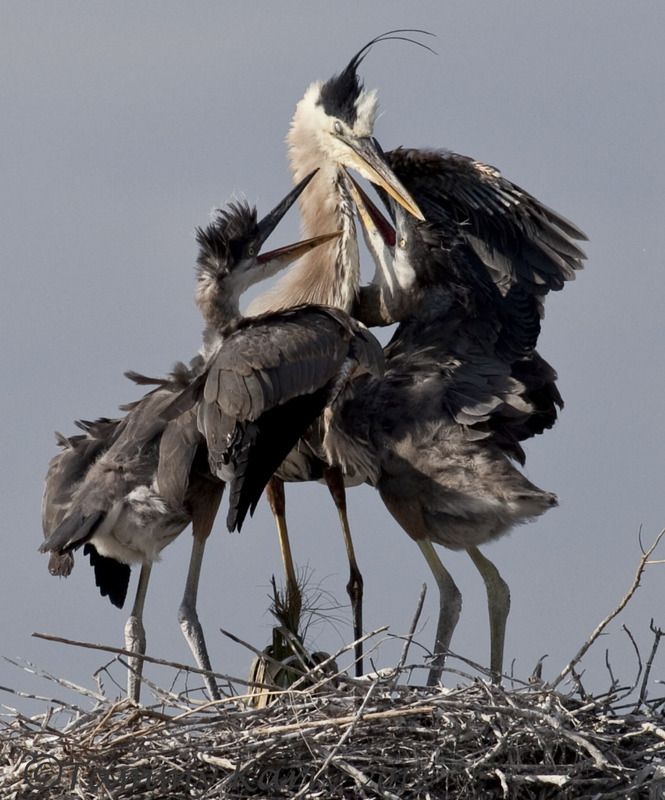 Stunning serie of the herons. 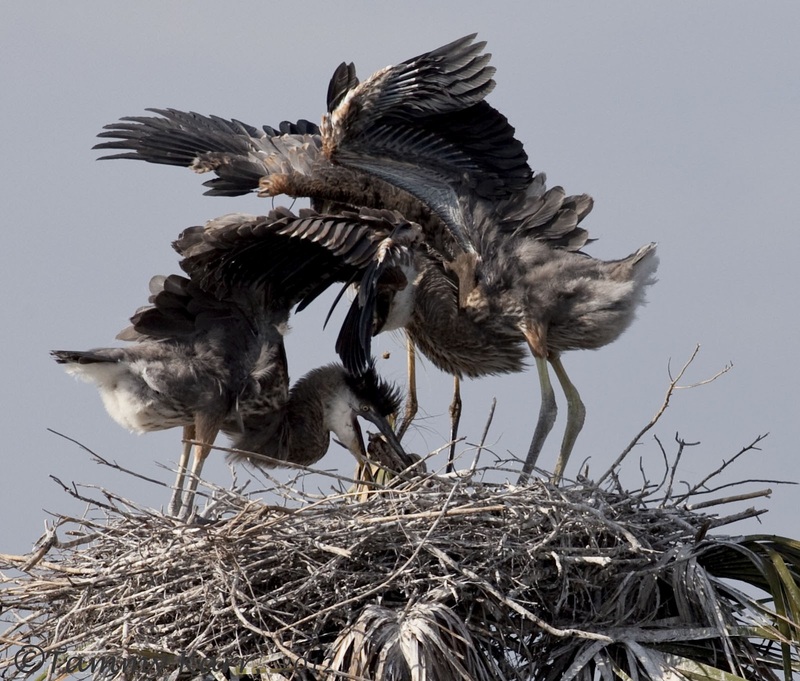 The way you captured the great herons in midair makes them look as if they are dancing. 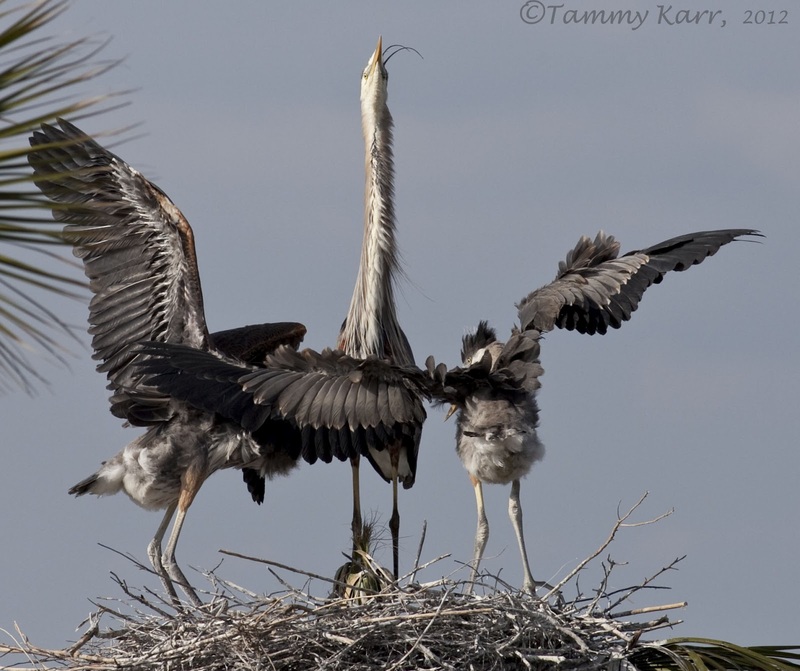 Your photography is always so spectacular, Tammy. they are awesome! it could be breathless to be there! I've never seen a big nest like that. Very good moments and captures. Beautiful birds, thanks for sharing. Tremendous images as ever Tammy. My favourite is the third one with the young clamoring for attention (food).